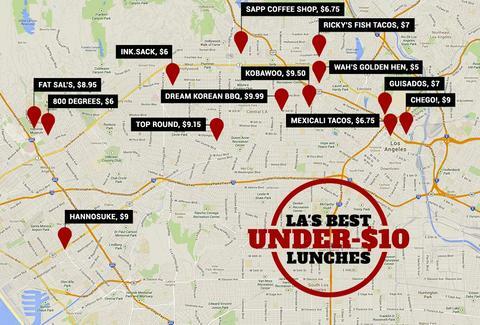 If you're getting lunch in LA, it's either A) cheap and from a taco truck that uses "beef", or B) $15, which's why we hit up the dude behind the daily $10-and-under lunch blog Midtown Lunch (and the super-sweet podcast Food Is The New Rock) to get his picks for the absolute best spots where you can get full on a single Alexander Hamilton. 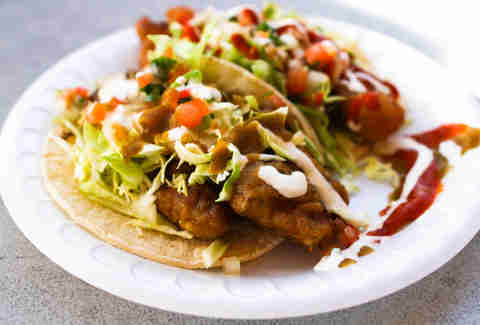 What You're Getting: "Two deep-fried, Baja-style fish and shrimp tacos, and a fresh agua fresca. This long-standing favorite still does fresh, fried-fish better than just about anyone from its free-standing Virgil truck." What You're Getting: "Any of their sandwiches. 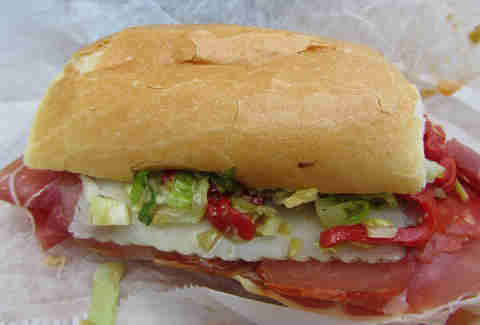 Nobody would have blamed Michael Voltaggio for cashing in on his Top Chef winner status by opening a $12 sandwich shop next to his restaurant Ink, which makes the prices at Ink.Sack all the more incredible -- the porky Jose Andres and the spicy banh mi are two all-stars, but every single one's a winner." What It Costs: $6 per-sandwich, plus a couple extra bucks for a side of pork rinds. What You're Getting: "Pizza. 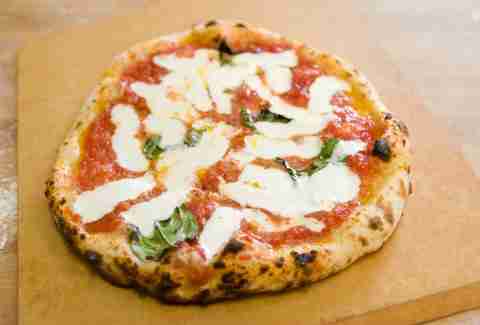 This crazy-good pizza from the Umami Burger dude operates on a Chipotle-esque pick-your-toppings model, which means you've got ultimate control over what your 'za costs you." What It Costs: $6 for the pie, plus a bit more depending on your topping choices. 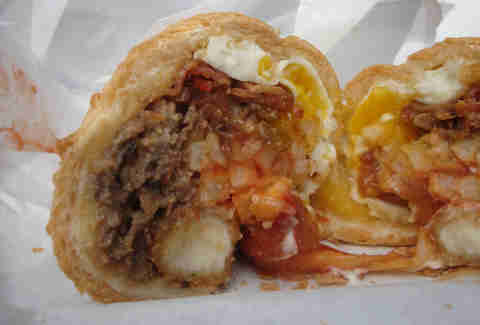 What You're Getting: "The Fat Jerry. You can't go wrong with anything at this let's-throw-everything-and-the-kitchen-sink-in-your-sub shop, but you're definitely going to want the Fat Jerry, which tops a cheesesteak with chicken fingers, mozzarella sticks, bacon, eggs, and French fries." What You're Getting: "The Combo. 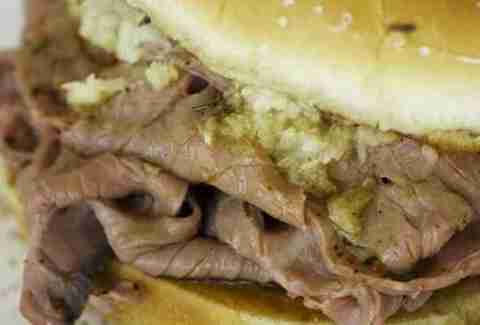 This upscale Arby's on La Brea hand-cuts its roast beef. They literally just dropped a combo with a sando, a drink, and curly fries that won't empty your wallet, but will fill your stomach." What You're Getting: "Jade Noodles. 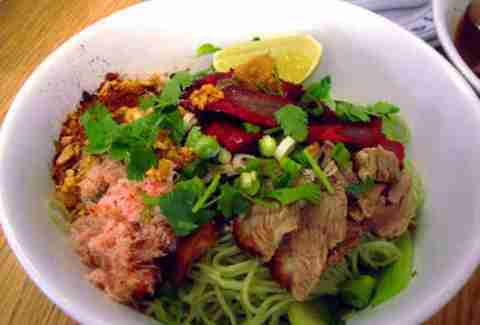 If you're sick of dropping $20+ at Jitlata, hit this Thai Town spot instead -- its sweet noodles're less than half the price, and are loaded with crab, pork, and duck." 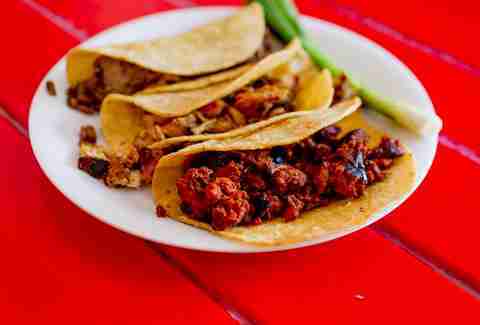 What You're Getting: "A vampiro, a taco, and a drink. This formerly illegal street vendor kept its prices cheap when it moved into this brick-and-mortar just over two years ago, and its lunch combos make things even cheaper; the pro-move's to avoid the two- and three-taco combos and to load up on vampiros -- these crunchy, garlicy bites of amazing." What You're Getting: "Everything. Forget about under $10 -- lunch can be half that at this actually-good East Hollywood Chinese food dive. 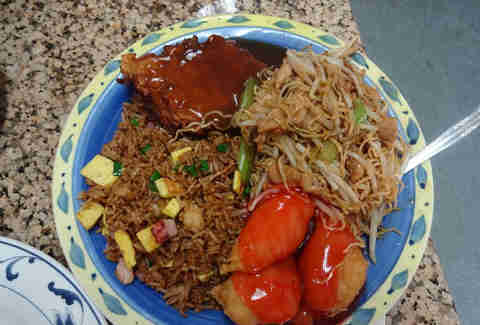 For $4.50, you get to choose three items from their four-item menu of fried rice, chow mein, sweet and sour chicken, and one of the best egg foo yungs you'll find in all of Los Angeles. Recently hit a jackpot in Vegas? They'll give you all four for an extra 50-cents." 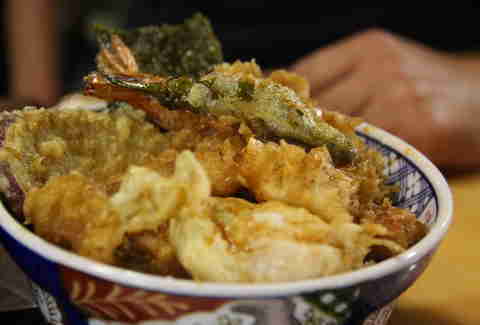 What You're Getting: "The shrimp tempura-don. This small stand in the Mitsuwa Marketplace serves up some of the best tempura in Los Angeles, with a bowl that comes with shrimp, vegetables, seaweed, and shishito peppers, plus a tempura-fried poached egg to break over the whole thing." 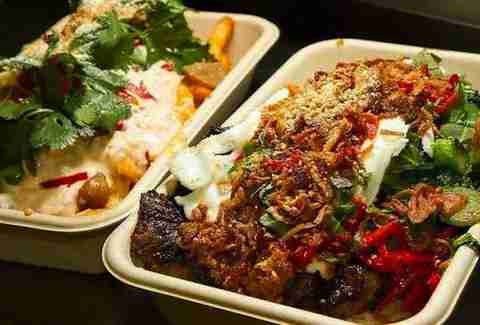 What You're Getting: "The Beefy T. Super-acclaimed Chef Roy Choi may have moved his affordable Asian rice bowl spot from Palms to Chinatown, but it's still a great, cheap lunch destination. They've added new bowls that are inspired by their new digs, but you can't go wrong with the classic, meat-laden Beefy T. Looking for even more of a lunch-time deal? Their '$12 Salad' actually costs $7." What You're Getting: "The Sampler Plate. 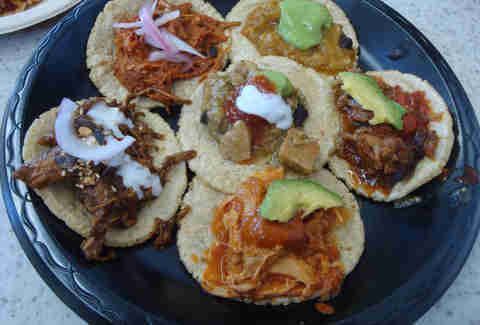 Every restaurant should have a sampler platter like the one that you get at Guisados (now in Echo Park and Boyle Heights), with mini-versions of the first six tacos on the menu (they change, but usually are, like, tinga and cochinita pibil, and awesome), all served on their delicious homemade corn tortillas." What You're Getting: "The Bossam Plate. 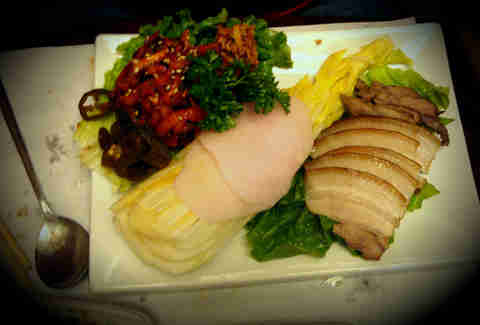 Kobawoo's got some of the best pork belly that exists -- they call it Bossam, and it is, um, Aossam. At dinnertime, a platter of the crazy-delicious meat will run you anywhere from 20 to 35 bucks, but at lunchtime, it can be had for just under $10, and comes with all the lettuces and daikon slices for wrapping and face-stuffing." What You're Getting: "All-you-can-eat. Duh. 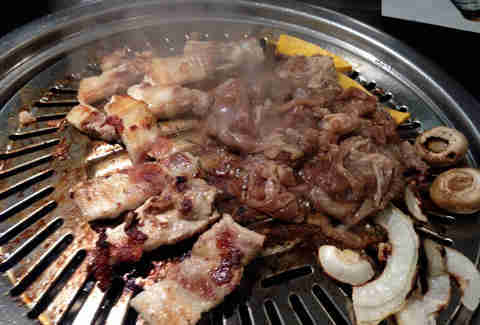 Stuff your face with HQ bulgogi and a monstrous salad bar that's also stacked with pre-made braised meats. Then do it again."